Jubilee Cake Studio compensated me for this blog post. All opinions are my own. Jubilee Cake Studio is located in Mechanicsburg, PA, a few miles southwest of the capital city of Harrisburg. The Studio is just two blocks from the main street that runs through downtown. There is parking across the street. 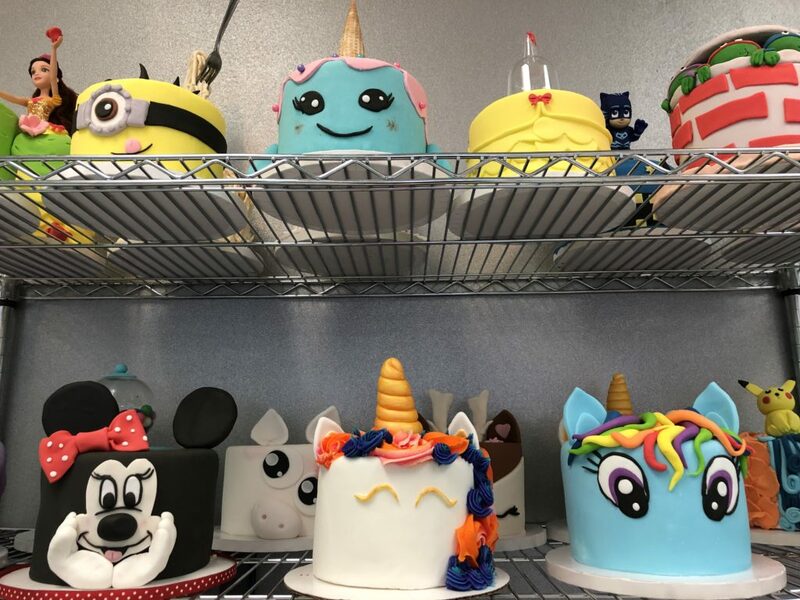 Jubilee Cake Studio offers walk-in cake and cupcake decorating, scheduled workshops where you can learn how to decorate a specific style of cake, and parties. They do the baking, you do the decorating! Walk-ins are available during the Studio’s normal business hours. 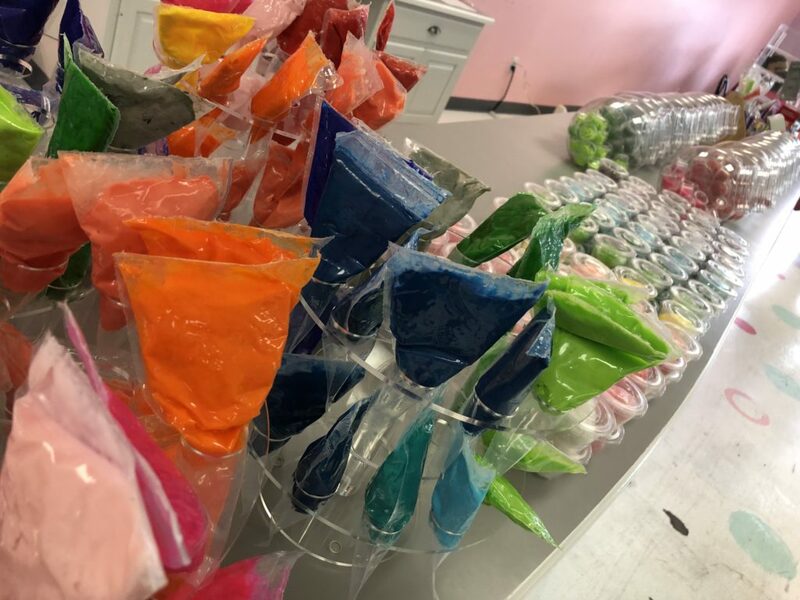 Upon entering the Studio, you’re greeted by amazing colors and options for cake and cupcake decorating. Start at the case of cakes and pick your favorite color of cake or flavor of cupcakes. 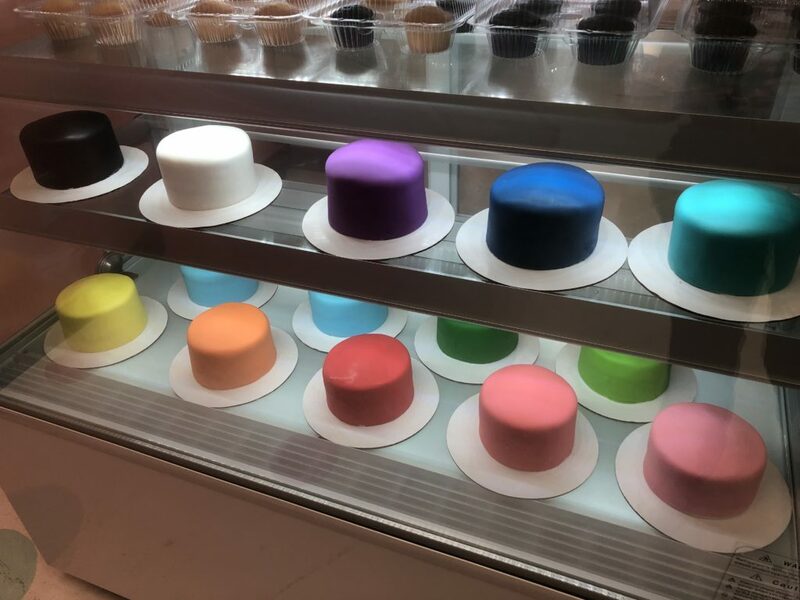 Cakes are 5 inch round, two-layer cakes with vanilla buttercream and covered in beautiful, brightly-colored fondant. Cupcakes come in four-packs with yellow and chocolate flavors available. 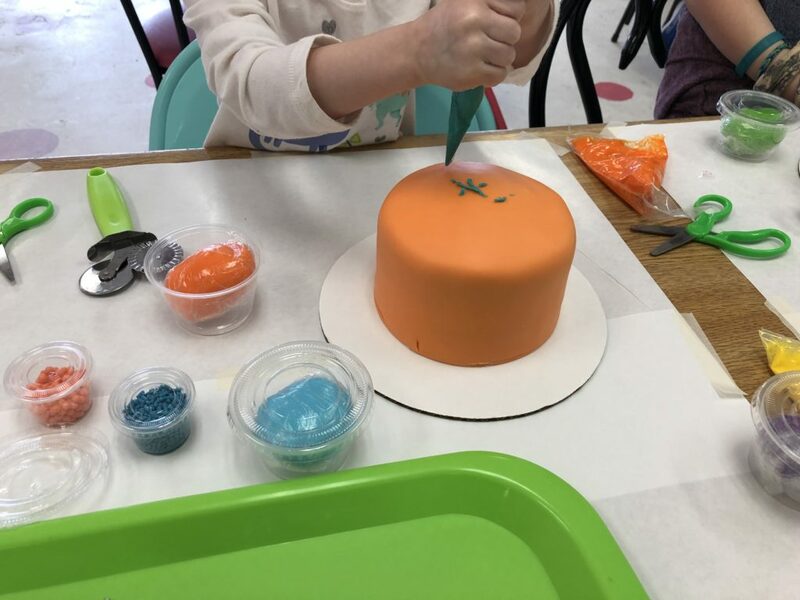 After choosing a cake or cupcakes, the pay-one-price decorating package includes three icings, two sprinkles, and two colors of fondant. Tip: If your party is decorating several cakes, have everyone pick different colors and share! The Studio provides a tray to carry all of your goodies to a table to start decorating. 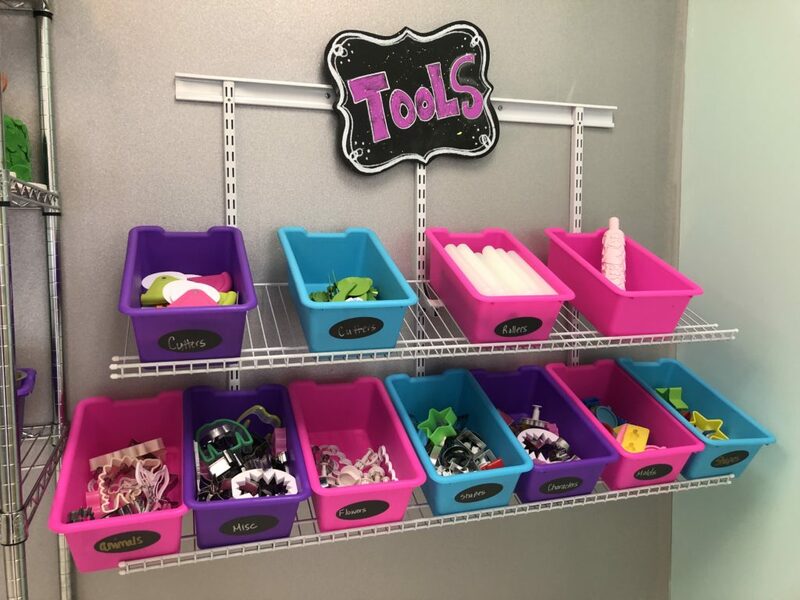 Once settled at a table, you can go to the tools area to pick all kinds of stencils, cutters, rollers, scissors, etc. There are so many things to choose from! There are also display cakes to give you some ideas on ways to decorate your cake. Take all the needed tools back to your table, and begin decorating! Once you’re finished, they provide boxes to transport your cake. Workshops are a chance to learn how to decorate a themed-cake, with all of the supplies included. Each workshop is geared toward a certain age group, so be sure to check the age range before registering. Many workshops are for ages 5 and up, but there are special workshops for toddlers and preschoolers. Each workshops features a specific themed cake, whether it be something from pop culture (Minecraft, Harry Potter, etc) or themed around the current holiday. There are a limited number of seats available for each workshop, so be sure to check the Studio’s website often and/or follow the studio on Facebook for the latest workshop offerings. Please keep in mind that minors must be accompanied by an adult for each workshop, and each student must purchase their own cake kit. Cake decorating parties are fun for birthdays, bridal showers, friends night out, and more! Each party reservation includes two hours of table time, all the tools you need to decorate your cake, plus a party hostess. Parties can also be reserved on their website and are available most days of the week. Watch that the piping bags don’t start to have icing come out the top. While the kids weren’t using the icing, I’d make sure the icing was close to the bottom of the bag and ready for use. It can get messy! Embrace the mess by having your kids wear older play clothes or an apron. Follow the Studio’s Facebook page if you’re planning to do walk-in decorating on a weekend. They often post when they are especially busy, so you can time your visit when tables are available.